WHILE we’re sure Toyota and other car makers often throw their support behind treks and expeditions, but there aren’t many scientific research projects quite like the one Toyota Australia is currently backing, throwing their support behind the search for Thylacinus cynocephalus – better known as the Tassie Tiger. An international team of naturalists from the Centre for Fortean Zoology is right now combing Tasmania to search for the Tasmanian Tiger, in one of the biggest concentrated ongoing searches yet for the elusive animal, which was officially declared extinct in the early 1980s. Expedition leader Michael Williams said the six-week trip – the second of its kind, which has been sponsored by Toyota Australia – is exploring densely forested areas in the State’s north and south west. Danish zoologist Lars Thomas has joined this year’s expedition, and said the Tasmanian Tiger has long been a source of interest for him. “The Tasmanian Tiger is possibly one of the most fascinating ‘extinct’ animals I can think of – for me it’s very much an animal of the Victorian era, evoking the frontier times of Australia’s convicts, colonists, and early Aboriginal tribes,” Mr Thomas said. The team is traversing the difficult terrain in two Toyota 4WD LandCruisers (see story below), using sophisticated game cameras, starlight scopes, and dash-cameras to monitor wildlife. [symple_box color=”blue” fade_in=”false” float=”center” text_align=”left” width=””]We had the opportunity to talk exclusively to the team after their previous exhibition about Toyota’s involvement, and just what the LandCruiser’s were like. We traversed the difficult terrain in two Toyota LandCruiser 200s – the luxury Sahara V8 Turbo-Diesel and the more rugged GX V8 Turbo-Diesel. The Sahara offered a comfortable ride and proved easy to manoeuvre in the bush and was surprisingly quiet, so much so that we snuck up on quite a bit of wildlife and had to be quick with the brakes. This is where the smart braking technology came into play, ensuring we stopped quickly and avoided skidding. The vehicle featured a slick upmarket interior – leather seats, wood trim and a dashboard sparkling with every mod con you could conceive including satellite navigation, Bluetooth connectivity, and a handy reversing camera, which ensured we didn’t squash any of the team who happened to be ambling past. The capable GX V8 quickly cultivated our trust, with its minimalist and un-fussy workhorse looks – complete with snorkel – making you feel like you’re really heading for an off-road adventure. It’s a fulltime 4WD with a massive 138lt tank, which is reassuring when you’re heading in the opposite direction from the last service station for several days. We added our own dash-cameras to the vehicles, fitting them to the inside of the windscreen and powering them with the cigarette lighter. 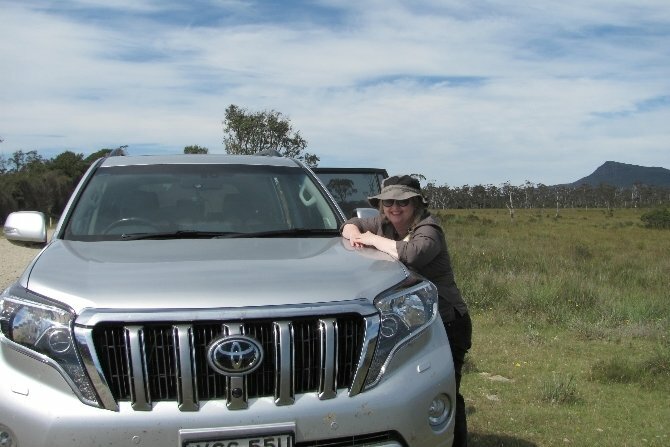 This allowed us to film wildlife running across the road in front of the car and, maybe, catch a Thylacine on the run. What did the Toyota’s let you do and how did they perform? The Toyota’s allowed us to access roads and terrain we would have otherwise been unable to reach, and transport our large team. Both cars performed incredibly well, given the weather and terrain we encountered. Another challenge for us, which the turbo diesel addressed, was the need to transport large quantities of food and water and camping gear, which the spacious boots of both 4WDs accommodated easily.